Three years ago Northside High School track standout Sydney Wright first stepped onto the campus of the local high school to begin her sophomore year. Reflecting on that time, Wright admits she had somewhat of an attitude. The move was a result of her mother’s new job at Fort Benning. Veronica Wright chose for her daughter to attend Northside and moved into the school’s zoned district just in time for the start of school. Now a senior, Wright still remembers the loneliness of being a newcomer. “I had a really bad first day. I felt like a freshman again. I didn’t know anyone and I didn’t know where to go. But the next day was better because some people actually took the first step and reached out to me,” she says. In time, Wright settled in but it wasn’t until the beginning of track season that Wright finally felt like she belonged. 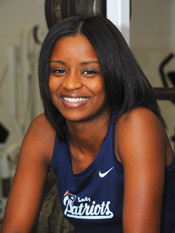 Prior to moving to Columbus, Wright had been a track athlete in middle school and as a freshman at her former school. She specialized in sprinting and she brought her love for it to Northside. 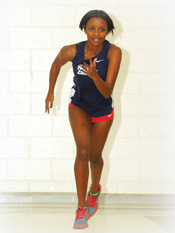 On the track, Wright saw a little bit of improvement in her performance from her freshman year. She sort of cruised through the season, participating in the 100- and 200-meter dash events and was a member of the school’s 4×100-meter relay team and 4×400-meter team. While she made friends and held her up her end of the responsibility as a Lady Patriot, she confesses she was not very serious about athletics or academics. “I just didn’t care. When I was a freshman and a sophomore I really didn’t think too much about my grades or going to college. I was enjoying the time. And, I really didn’t understand that I was good enough at track to use that to get to college,” says Wright. Her attitude spilled over a little into her athletic endeavors. Occasionally, she recalls, her coach would have to get her attention by bumping her from the A team to the B team. Wright holds no animosity about the strategy because it helped her to realize she had the talent to run at the top level. She was the only thing holding her back. Northside track coach Joe Sanders has been coaching girls track for 16 years, eight of which have been as the head track coach at Northside. He’s seen his share of teenagers who need a little incentive to get on the right path. With Wright, Sanders says it was obvious from the very beginning that Wright had a gift to run track and to become good at it. “She didn’t necessarily see it that way when she first arrived. After some time adjusting, making new friends, settling down and adjusting to a brand new coaching staff, she started to change her attitude, work ethic, and perspective about running track at Northside,” says Sanders. Her coach credits Wright’s parents and Northside coach Christopher Porch as being instrumental in helping steer Wright in the right direction, but ultimately Wright had a reality check and made the changes she needed in order to succeed. “It just clicked my junior year. I found out that if I wanted to go college I needed the grades and track to get me there. So, I started focusing on my grades and I guess I just matured but it was something I had to do for myself. No one else could do it for me,” she says. Her junior year, Wright rocketed to the top of her game. She broke the school record for the 100-meter dash that had previously been held by former Northside track athlete Heaven Briggs during the Girls State Track Meet in Albany, Georgia. Wright’s new Patriots record stands at 12.29 (outdoor). She also holds the school record for the 60-meter dash at eight seconds (indoor) but she is planning on setting a new school record this year for the 200-meter dash while also looking to best her own record for the 100 meter. Wright is quite certain both of the goals she has set for the 2014 track season are attainable. The 5’3”, 110-pound athlete is lightning fast and has a few accomplishments to her name. According to Sanders, Wright is the defending region champion in the 100m and 200m dash. She has speed but Sanders feels one of Wright’s greatest strengths is her determination. “Sydney has a very strong will when she wants to do something. She is able to stay focused and set goals that she can attain. She can be very witty and she gets along well with others,” he says. Wright’s reinvention of herself paid off. Her hard work and talent have earned her a chance to be a collegiate athlete. 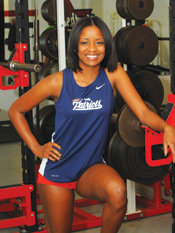 In January, Wright signed a letter of intent to attend Troy University in Troy, Alabama, as a track athlete. Troy is a Division I school and Wright is practically giddy about the opportunity she will have beginning in the fall. “I just can’t believe it. It probably will not hit me until I move into my room but I am so excited! There were two reasons I chose Troy. One, they were the only ones to really act like they wanted me, and two, I just clicked with the coach. And, everything was new there,” she says with excitement. 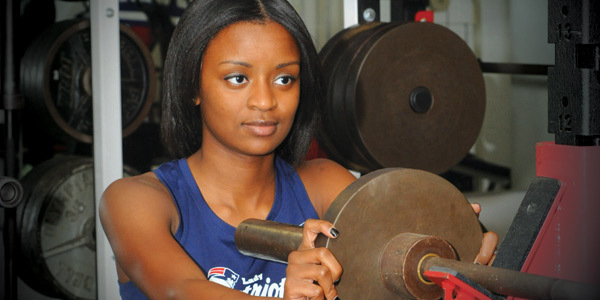 Before she heads off to college, Wright is very focused on her last high school track season. She is highly competitive but usually that trait is directed inward. Wright wants badly, though, for her team to record a state championship this season. She feels the Lady Patriots have a good shot at that goal with the combined talents of several seniors and other members of the track team. It’s hard to believe the confident and mature young woman of today ever had a few wayward years, but her truthfulness about the road she has traveled is refreshing. She might have redirected her focus but the honesty still remains to some degree. Pets: Yorkie named Titus. Actually, he’s my sister’s dog but I claim him. Person she most admires: My mom. She’s a breast cancer survivor and means the world to me. Best thing about Northside High School: My coaches and my friends. I am Sydney’s aunt and very proud of her. She was born to run! Way to go Sydney! You have a great and promising future. Shorty ROCKS!!! You have one of the strongest role models ever…your mom! YOU ROCK LIL CUZ…I’M PROUD OF YOUR ACCOMPLISHMENTS, MENTALLY AND PHYSICALLY… GOOD LUCK TO YOU AND YOUR TEAM IN STATE THIS YR…& BIG CONGRATS ON PURSUING TO FURTHER YOUR EDUCATION & TRACK CAREER AT TROY!!!! U GO GIRL!!! !